(Steve Griffin | The Salt Lake Tribune) Audience members listen to Gov. Gary Herbert as he reads a scripture from the Bible at the Utah Capitol Rotunda as part of Salt Lake City being selected as the National Bible City for 2013 Monday, Nov. 25, 2013. In his speech, Netanyahu had referenced the Old Testament tale in which Moses strikes a rock with his staff to draw water for the Israelites, who were wandering the desert after their exodus from slavery in Egypt. It’s doubtful that Moses made it across the Arabian Peninsula on foot and even less likely that he was able to tote a large quantity of water out of that rather arid region. But although one might be tempted to laugh off this misprint as either an isolated incident or the folly of godless coastal media elites — the original line had to have been seen and approved by at least three Journal staffers before being published — such religious illiteracy is far more widespread than that. According to a survey last year by LifeWay Research, more than half of Americans have read little or none of the Bible. Theologian Albert Mohler has noted, aghast, that more than 10 percent of Americans believe that Joan of Arc was Noah’s wife. In 2010, the Pew Research Center revealed that only half of self-identified Christians could identify the four Gospels. (In case you’re wondering, they’re Matthew, Mark, Luke and John.) And as the number of religious “nones” in the United States continues to rise, the amount of even cursory religious knowledge we share seems sure to fall. Some might say that this de-pedestaling of the Bible — and, by extension, Christianity — is a good thing. After all, The Journal’s Moses correction went viral only when a Jewish reader noted that it was delightfully Passover-appropriate. (Chag Sameach!) What about those of other faiths, or none at all, who so often have felt invisible or second class by blanket assumptions of a Christian identity in their schools and public places? It’s a fair critique. The idea that “America is a Christian nation” has often — and with increasing frequency — been weaponized by those who would use it as a tool of exclusion. These selfsame Christians often conveniently fail to discuss exactly what the tenets of their faith really ask of them. But when it comes to the Bible, it’s not necessary to believe (though there are benefits to faith, too) to derive meaning from the text. As a reference point, the Bible is a skeleton key that unlocks hundreds of years of culture, from Shakespeare to Kehinde Wiley. The conservative uproar about Wiley, President Barack Obama’s portraitist, having painted images of black women “decapitating white women,” a reference to his “Judith and Holofernes,” might have been avoided had critics known that the work was an allusion to the religious story, a traditional artistic theme. (Then again, it might not have.) And many of the book’s moral lessons have become more, not less, relevant with time. Without knowing them, how could one parse the Rev. Martin Luther King Jr.’s “Letter From Birmingham Jail”? In a broader sense, having widely understood cultural references and conversational touchstones can be deeply important when it comes to building a sense of community. In a nation with a comparatively short history and extremely diverse population, they provide shared context for discussion and a common language of expression — even if one might disagree on the meaning. At the moment, Americans seem to have few truly shared texts, and their number seems to shrink daily. In response to The Journal’s gaffe, a few wags noted (tongues only partially in cheek, one must presume) that most Americans would be more likely to recognize a Harry Potter reference than a biblical one. 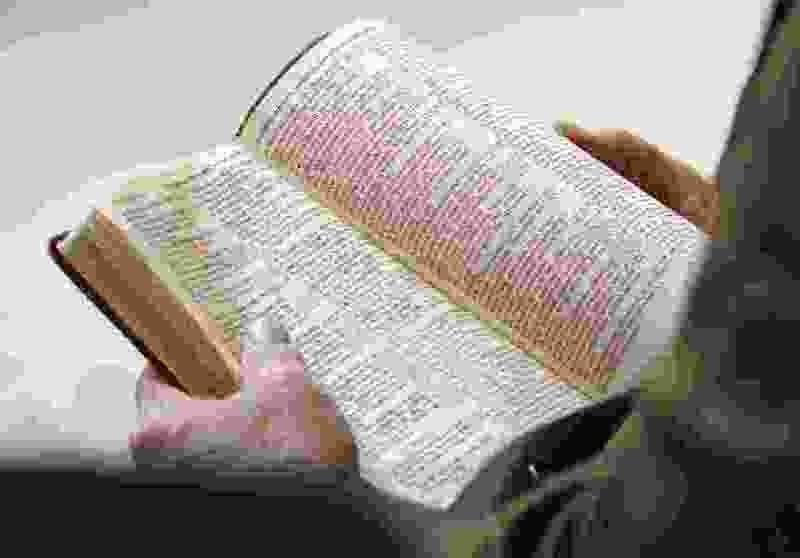 Even nonreligious reference points such as the Constitution are falling by the wayside: More than one in three Americans can’t name a right protected by the First Amendment. We’re already seeing the negative results of a splintered public consciousness. The audaciously divisive (and probably effective) Russian ad campaigns during the 2016 election campaigns tapped into our increasing sense of personal disconnection from society. The inability to define and project a shared vision for our country is now a constant on both sides of the political aisle. Although broader familiarity with the Bible might not restore the United States to its former glories, it probably wouldn’t hurt. In the meantime, this week’s correction stands as a sign of the times.